The UW Art Museum plays a vital role in undergraduate and graduate instruction at the University of Wyoming. By initiating a teaching gallery model, the Pat Guthrie Special Exhibitions Teaching Gallery supports the University’s academic mission by working with faculty to select works of art from the permanent collection for specific courses that are available to students in the current semester. American Consumer Culture examines the social history of mass consumerism in the United States from the end of the nineteenth century to the beginning of the twenty-first. It surveys major political and economic turning points and considers the ways Americans of different backgrounds have embraced, resisted, and shaped consumerism through individual choice and collective action, paying attention to both its critics and its champions. These works introduce the diversity of perspectives through which artists have confronted the cultural and visual impact of consumer society. Painting I is an introductory level course that introduces problems in painting, develops skill, techniques, and concepts. With the emphasis on mastering techniques, lectures and critiques guide the students through an understanding of the processes of painting. 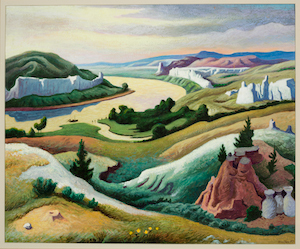 The artworks introduce students to a variety of approaches to landscape painting. American Art History addresses American art within the continental United States from the first European encounters with the New World to 1900. Investigations in painting, sculpture, and architecture will be covered, as well as some photography, prints, and decorative arts. Students will investigate the use of portraits and landscapes that created an American genre. Investigating Cultural Diversity and Identity through Art engages students of all majors in deep looking and inquiry with original art in the Art Museum. Through this process, students learn how to think — about culture, diversity, and identity — as they explore the art, research related ideas and topics, and develop a final project based on their personal investigations. 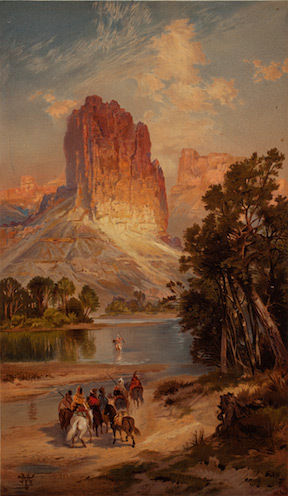 The art of Thomas Moran is one exhibition they are studying this semester.